Audrey Azoulay à la tête se l’UNESCO..Une victoire à l’arrachée! The city of Marseille as European Capital of Culture 2013, has awarded its Peace Medal to André Azoulay, "citizen ambassador of the Mediterranean." Le Matin.ma 05.04.2013. In 2008 André Azoulay was elected president of the Anna Lindh Euro-Mediterranean Foundation for the Dialogue Between Cultures. It is a network of civil society organisations dedicated to promoting intercultural dialogue in the Mediterranean region. It was set up in 2005 by the governments of the Euro-Mediterranean Partnership (Euromed), a political agreement made in 1995 between the European Union and Algeria, Morocco, Tunisia, Egypt, Jordan, Lebanon, Palestine, Israel, Syria and Turkey. It is named in honour of Anna Lindh, the Swedish Foreign Minister who was murdered in 2003. The name was put forward by Egypt at a meeting 25 September 2003. The Foundation’s headquarters are in Alexandria in Egypt. André Azoulay (born 17 April 1941) is a senior adviser to king Mohammed VI of Morocco. He previously advised Mohammed's father, king Hassan II. He currently presides over the Anna Lindh Euro-Mediterranean Foundation for the Dialogue Between Cultures, based in Alexandria, Egypt. He is also President of the Executive Committee of the Foundation for the Three Cultures and the Three Religions, based in Seville, Spain, a founding member of the C-100 Davos Forum for the Dialogue of Civilisations and religions, and was formerly Executive Vice-President of the BNP Paribas, Paris. Born in Essaouira, in 1941 to a Moroccan berber Jewish family, André Azoulay was educated in Paris where he studied economics, journalism and international relations. Previously to his current position as Counsellor to the King of Morocco, Azoulay, had a long career within the Paribas Bank in Paris (1968 to 1990) where, as Executive Vice-President, he covered the Middle East and North Africa Regions as well as heading the bank’s Public Affairs department. 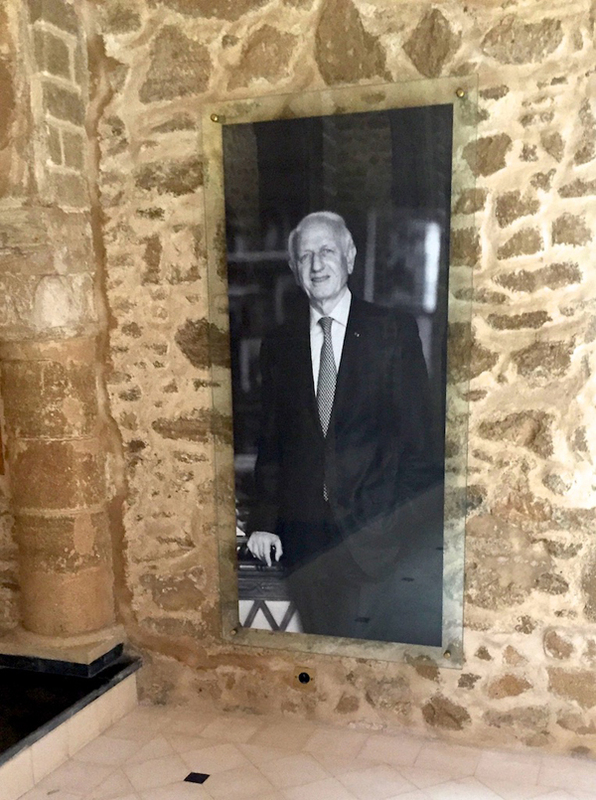 As Counsellor of the late King Hassan II from (1991 to 1999), and since then of king Mohammed VI, André Azoulay has largely contributed to the implementation of economic reforms, which have been applied throughout the kingdom since their inception in the early 1990s. He also played a significant role in the privatisation and deregulation programs which began in 1993. He emphasized the need for sustaining the role of the private sector and encouraging the international investment to sustain economic growth in Morocco. Azoulay has also largely contributed to promote Morocco throughout the world. With his wife Katia, also born in Essaouira, who published 2 books "Essaouira-Mogador : Parfums d’Enfance" and "Essaouira-Mogador : Passion partagée", he is the architect of the renaissance of the city they both hold very dear to their hearts. André Azoulay is fervent in the promotion and revival of his home town which has a specific place in the historical, cultural and spiritual heritage of Morocco. He is the founder President of the Association Essaouira-Mogador which has established since 1992 an original approach to the durable development based on its cultural diversity and spiritual legacy. :Seeberg, Peter; Michele Pace (2007). "Meddling or Muddling with the Mediterranean? French, Spanish and Italian Foreign Policy Making Towards the "South"". EU and the Mediterranean : Foreign Policy and Security. University Press of Southern Denmark. p. 136. ISBN 978-87-7674-220-1. Andre Azoulay: Arab public views Israel as the party responsible for preventing peace, not the Arabs. André Azoulay: "L'islam marocain est à la fois moderne et engagé contre la radicalisation"
et on résiste au vertige et au confort de l’oubli"